Yvonne Freckmann is a composer, pianist, and sound artist. 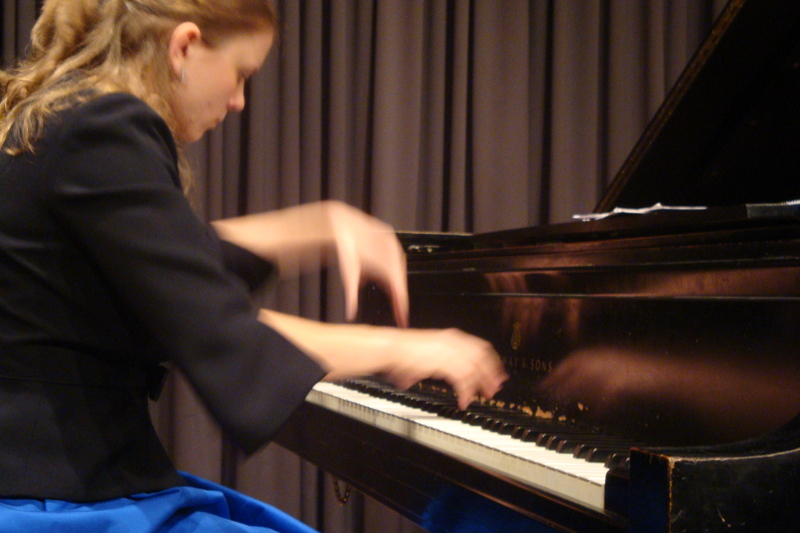 She was awarded a U.S. Fulbright Grant to study composition at the Royal Conservatoire The Hague in the Netherlands in 2014, completed her second master’s there. Current endeavours include writing music for ensembles, music theater, location-based performance, graphic scores, and sound walks. She was Artist in Residence Krems in Austria during June 2018, composing and presenting an exhibition and cello performance with Clara Rivière (cello), Adriana Affortunati (visual arts) and Jana Dabac (architecture). Yvonne has been performing with Dutch windmills in a music theater collaboration The voice of the windmill, for windmill, harp and wind, with Iris van der Ende. They will present in Gaudeamus Muziekweek in September 2018 in Utrecht. Their collaboration Onder de brug (Under the bridge) was premiered in Over Het IJ Festival and will come to two other exciting bridge locations in Amsterdam for the Grachtenfestival. Another project for all of the senses, Zvov Sensory, has toured in Belgium, the Netherlands, Denmark and Israel, enchanting blindfolded audiences with Zvov trio. She has presented work with these groups in Over Het IJ Festival Cultura Nova Festival, Gaudeamus Muziekweek, and Aarhus Jazz Festival. On the theme of homecoming Yvonne was commissioned by Musical Bridges Around the World in San Antonio, Texas to compose a trio “Bridge” on the occasion of their 20th anniversary. Yvonne earned a Master of Music in composition from the Royal Conservatoire The Hague, and from the University of Louisville as a Bomhard Fellow, and her Bachelor of Music in Piano Performance and Composition fromTrinity University in San Antonio, Texas. For more information about my life as a composer, please visit my blog and check out my music and videos! 2012 New Music Festival at the University of Louisville – Mr. Sidney King performed Dance Suite for double bass. 2012 10th Annual Festival of Contemporary Music in San Francisco – performed my piano solo, Teufelstanz, as well as Hong-Da Chin‘s flute/piano piece Longing for Home. Yvonne performs Teufelstanz at the 10th Annual Contemporary Music Festival in San Francisco 2012.